Allegretto is located near downtown Paso Robles, and is symbolic of the union between the town, its agricultural richness, and the wine country that has emerged from it. Without a doubt, you can feel the decadence and dedication to service as soon as you pull into the spacious parking lot. There are Valet attendants and doormen to greet you with a smile, and upon entering the lobby, the vaulted ceilings and artwork will gift you a sense of mysticism and an elevated lifestyle. Carrying the high class momentum is their in-house award-winning dining establishment, Cello, and you can’t help but feel like a king as you stroll through their rich hallways into open-air courtyards. To top it off, the in-room accommodations are on-par with the rest of the arrangement, with plush mattresses, stellar housekeeping, and all the proper furnishing to say like royalty. A weekend here is sure to thrill! La Bellaserra captures the essence of the modern Paso Robles lifestyle by combining functional elegance with amazing service. The Mediterranean and Italian influences are apparent all throughout the architecture and styling, and the pace of the staff and surroundings will allow you to relax while appreciating the subtle elegance of it all. Their signature restaurant, Enoteca, is unsurprisingly known for their eclectic menu that has spot-on wine pairings. That is one of the benefits of being in the Heart of Paso Robles Wine Country—every experience is enriched by the local offerings, which adds to the overall sense of being in the right place! Hotel Cheval is a bit different in its size and scope than many of the Paso Robles resort-style hotels, but it more than makes up for it in its boutique beauty and attention to detail. There is a quiet feeling of serenity and order bestowed upon visitors from the moment they enter the lobby. The ornate furniture and art are complemented by prompt and discrete service at every turn. This is the quiet yet elegant location that will be sure to create a lasting memory for a honeymoon, anniversary, or even just an amazing stay-cation in the heart of downtown Paso Robles. 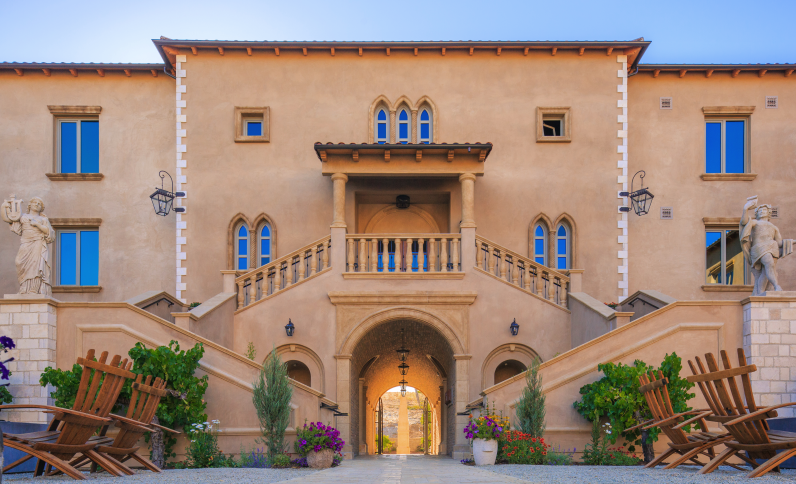 While one of the key features of many luxury hotels in the area is that they are near the Paso Robles wineries, CaliPaso combines the premises—they house guests at their award winning tasting room, and they do it well! With Villa style rooms surrounding the property, you can stroll from your bed to a glass of red in an instant. With banquet halls and fine dining in the mix as well, this stay is sure to be an all-in one masterpiece. 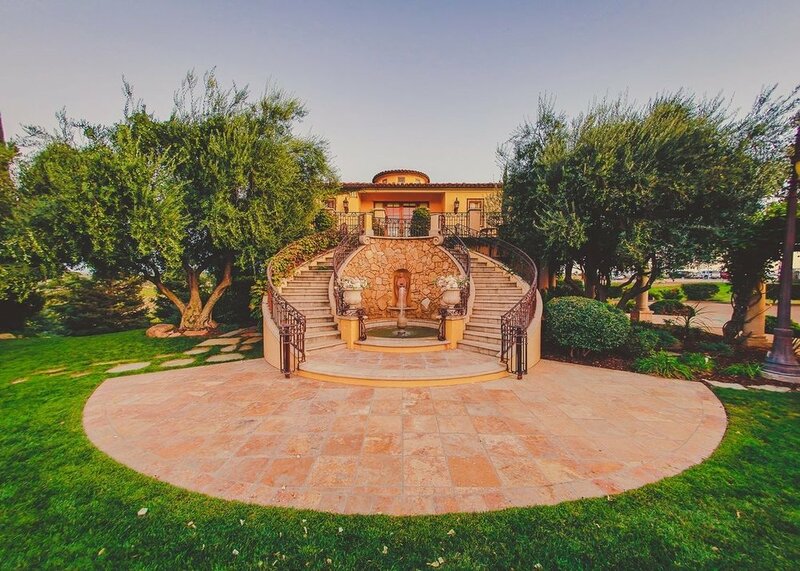 Their courtyards and fountains are as impressive as the view of the surrounding wine country—we recommend this stay for those who are into photography; the landscape is breathtaking from many vantage points on the property. Each of these Paso Robles hotels brings a unique spin to the luxury resort theme of Paso Robles accommodations, and there is no wrong choice among them. That is the beauty of being around such a scenic and exciting region that hosts so many award winning wineries—there is almost too much to do, and these venues are great bases to acclimate yourself to the pace and lifestyle of the wine tasting scene. As always, we recommend booking chartered luxury transportation for a wine tour or executive outing —contact us today for a booking!